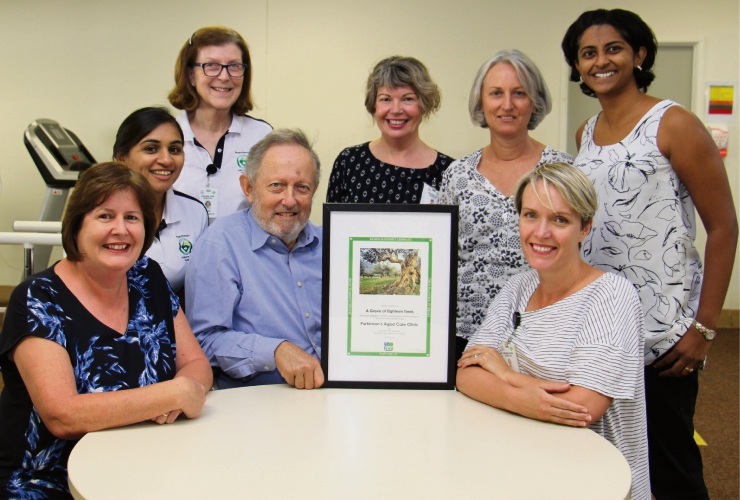 Joe Willner with Osborne Park Hospital staff Katriona Russell, Roshni Naran, Sara Freeman, Jo Pye, Anne Pielage, Darshini Richards and Jo Davey. AN Osborne Park Hospital patient has planted trees to honour staff that care for him. Joe Willner, who was diagnosed with Parkinson’s disease 14 years ago, recently travelled to Israel with his wife Sue and had a grove of 18 trees planted on behalf of staff at the Stirling hospital. “I think the staff at Osborne Park Hospital are fantastic and it’s great that they have a holistic approach to my treatment,” he said. “I can see medical specialists, physiotherapists, occupational therapists, speech pathologists, social workers and of course the Parkinson’s nurse specialists all in one place,” he said. Parkinson’s affects about one in 308 people and more than 100,000 Australians live with the condition. World Parkinson’s Day was on April 11 when Mr Willner shared a message of encouragement for other people with the condition.